Kids today spend far less time than they used to playing outside and dreaming up imaginative scenarios to act out. In fact, a recent study revealed that less than 25% of kids play outside at least seven times a week, as their parents did during their own childhood years. Furthermore, a lack of pretend play opportunities can actually stunt cognitive, social and academic development. What kids often need is a little encouragement to head outside to play on their own. One of the best types of encouragement is their own playhouse structure, especially if they had a hand in choosing the theme. You can skip the cookie cutter playhouse designs in favor of a custom solution with one of the following imaginative themes. Kids love to practice their commerce skills by arranging their toys for sale and collecting paper scraps as money. You can bring their imaginative storefront to life by creating the playhouse in a supermarket theme. Have your kids imagine up their ideal storefront with a cute name, shop colors and product lineup. Decorate the exterior with their chosen color scheme and sign. Line the interior walls with shelves and construct a front counter with a cash register, scale and scanner. For an open storefront, provide market stands your kids can use to display some of the w ares outside. With just a couple extra tower structures, the Petite Pentagon playhouse will instantly transform into an ancient castle. Coat the exterior in a layer of light or dark gray paint, and then brush on thin black lines to create the illusion of individual stones. Encourage your kids to create their own flags and banners to adorn the top of the castle walls. If you want to go all out, you could even surround the castle with a shallow custom pond in the shape of a moat. Remember to create a strong wooden drawbridge that can keep dragons out of the keep and provide safe passage over the moat. The Peach Pickers Porch and Bear Club playhouse styles are perfect for a farmhouse and barn design, respectively. You can set up the Bear Club playhouse as a barn by using a traditional red and white paint scheme. Add a diagonal cross brace across the top and bottom sections of the Dutch door to authenticate the design. Give your kids free rein when selecting the stain or paint for the farmhouse exterior. The covered verandah and plantation shutters lend an air of authenticity to the theme. Add a miniature carport next to the Bear Club playhouse to create a believable auto shop replica. The exterior design should reflect the vision your kids have of the auto shop they would like to own when they grow up. In the carport, place a toolbox filled with all of the basic hand tools to give your kids the ability to repair their own bikes and wagons. Your kids can design the inside of the auto shop playhouse as a showroom or extra workshop space. Petite Pentagon wooden playhouses are the perfect shape for a spaceship creation. Use metal shingles and white, gray and blue paint to recreate the iconic ship design. Add small black circles or ovals around the midpoint of the exterior walls to mimic the spacecraft windows. Inside, add a small kitchenette filled with astronaut food, flight seat rows and plenty of jumpsuits with helmets. Don’t forget the control station your little astronauts will use to pilot their spaceship around the universe. You can use the Custom Design Center at Summerwood to choose your wooden playhouses’ style, size, siding, roofing and trim specifications. If you need assistance, our designers can help you select the best playhouse structure for your theme. We will also provide a quote, schedule a delivery and even help you find a contractor to construct the dwelling for you. Of course, you can always use the provided assembly video and instruction guide to build the pre-cut playhouse on your own or with family and friends. Make sure to include your kids in the building and decorating process for immediate personalization of their playhouse. With most Americans dedicating up to a year total looking for misplaced belongings, it’s obvious that clutter is a time thief. When every tool and toy in your backyard has its own space, though, you can spend much less time searching for lost items and organizing your home. Start by creating a few dedicated structures designed for holding specific sets of outdoors items. If you take the time to plan out your landscape architecture design, you can integrate organizational nooks that actually accentuate the look and feel of your property. Here are five smart structures you can use to organize and declutter your yard. In just one fun-filled afternoon playing outside, your yard likely becomes a minefield of toys that your kids left behind. Kids love to live in the moment and drop whatever they are doing for the next fun activity so cleanup is really a chore if kids don’t have a dedicated place to store their belongings. Milk crates give your kids a place to keep their outdoor toys without the container filling with rainwater and you can stack the crates or use storage hooks to secure them to the side of your shed or fence. If your kids’ clutter extends beyond the random playground ball or Frisbee set, you may want to get a playhouse. 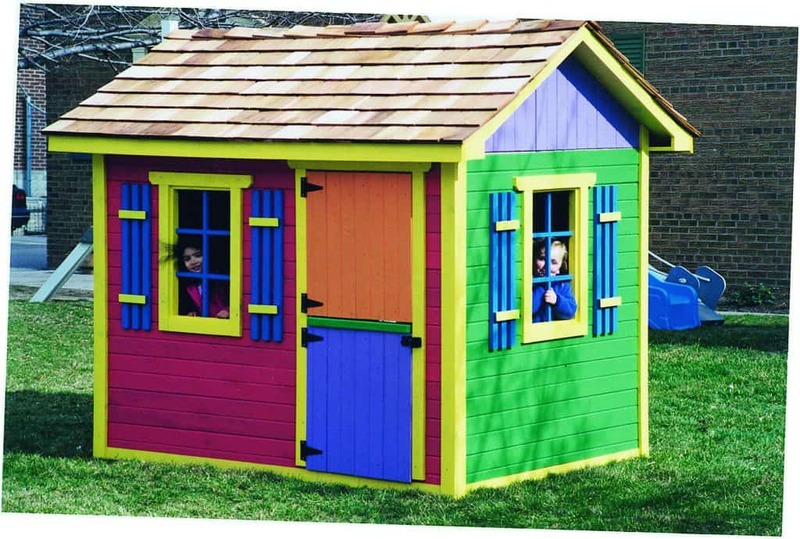 The tall roof on the Peach Pickers Porch playhouse, for example, allows kids to store their extra toys without cluttering up their own play space. Or, your kids may love to keep their toy bins on the covered verandah for accessibility during playtime. With a fun, designated place for kids to store their belongings, they’ll rarely need to be reminded to keep their dedicated space clean and organized. A garden or patio bench can double as a storage container by utilizing the open space below the seating area. You can find a storage bench premade or customize your outdoor seating to act as an organizational device. Benches allow you to keep your frequently-used gear near specific areas of your yard. For example, you can store your small landscaping tools, kneeling pads and gloves in a bench near your garden beds. Of course, don’t forget to tuck away your seat cushions in the bench to protect them from the weather and local wildlife. Extra shelves in the garage allow you to organize your outdoor tools and products along the otherwise unused wall space. The garage shelves can store bins and baskets you use to keep similar items together. You can also arrange the items along the shelves on their own to keep them highly visible and accessible at all times. You will need to determine the best placement and sizes for your garage shelves to keep parking and work areas open and clutter free. When you just have too much outdoor gear, you may need to invest in a storage shed to hold everything. The storage shed provides both wall and floor space for your landscaping tools, garden products and outdoor recreational items. Custom storage sheds can fit in the corner of your yard, nestle up to the side of your home or stand on their own in a dedicated section of your property. The lean-to and five sided storage shed designs help maximize your storage space without taking up too much of your property. If you want the garden shed to steal the spotlight, you can customize the design and paintjob to match your house’s architecture. You can even add garden beds and planter boxes around the outer perimeter to dress up the place. Once you have your landscape architecture plans in hand, contact Summerwood for assistance obtaining the sheds and shelves you need for your yard makeover. You can deeply customize the pre-fabricated sheds to meet your organizational needs. When ordering your shed, you may want to match the exterior siding, paint and trim to your home or create a brand new design. Large and small garage shelf arrangements allow you to make the most of your available space. You can determine an ideal number of shelves to purchase by measuring and planning your garage layout before ordering.